Harris Bus, an established bus operator in the Grays area, updated its fleet and branding late in 1996. From a Birminham style blue and cream the livery changed to a new eye-catching livery by Best Impressions, in pale green and blue with orange relief, plus copious sign-writing and route-branding, ensuring that they were not overlooked by the public. 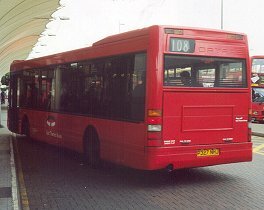 The new buses were four Excels, numbered 320-323, which arrived in December 1996 for Grays area routes serving the shopping pit at Lakeside.. 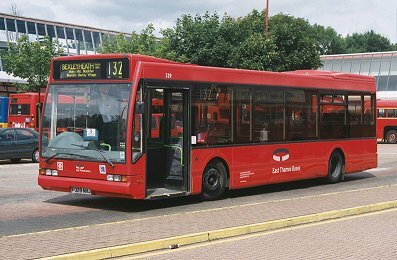 They were branded as the Thurrock link, for routes 383, 384 and 385, linking Lakeside with Tilbury and Chadwell St.Mary. During 1998 a 10.0m Optare Excel was loaned to Harris Bus by Optare. I don't know whether this was to cover shortcomings in the main fleet. The bus stayed with Harris Bus until their demise as a bus operator. 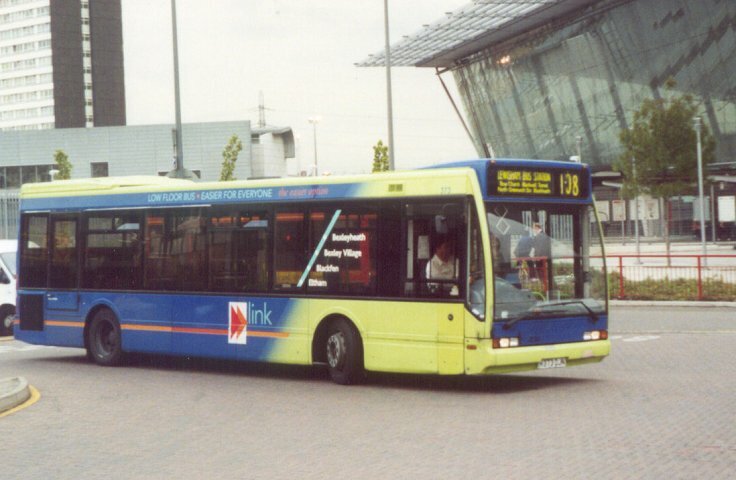 Not in standard livery, but in one akin to London United's, it was used on the Thurrock routes, not the London ones. 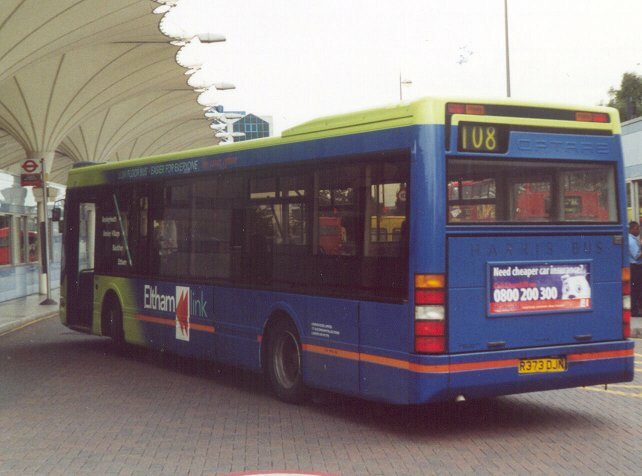 It returned to Optare in December 1999. 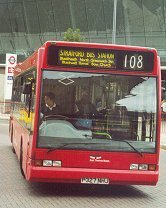 Harris Bus then entered the fray of London bus tendering in 1997, winning first a school-days only contract for the 661, and then the long-established Blackwall Tunnel route 108 (Stratford - Bromley-by-Bow - Blackwall Tunnel - East Greenwich - Blackheath - Lewisham), starting in June. For this Harris set up an outstation in Crayford and bought a fleet of another eleven 10.7m single doorway Optare Excels. 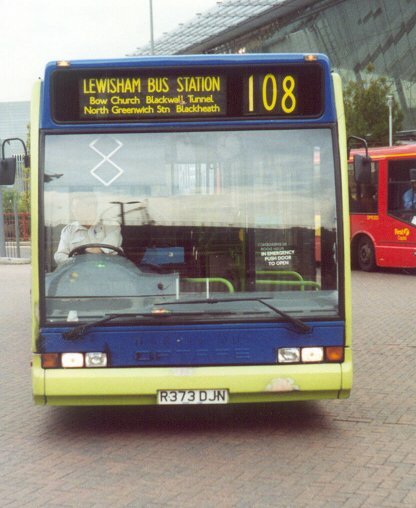 These, in the new livery were branded as the Lewisham link. 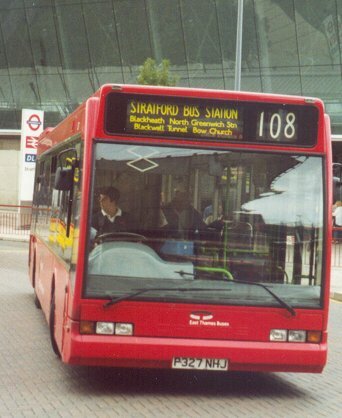 XL327, freshly into East Thames Buses' livery in August 2000, on its regular 108, at Stratford Bus Station. Harris won more tenders with double-deckers, and then in 1998 took on the 132 with another eight Optare Excels. 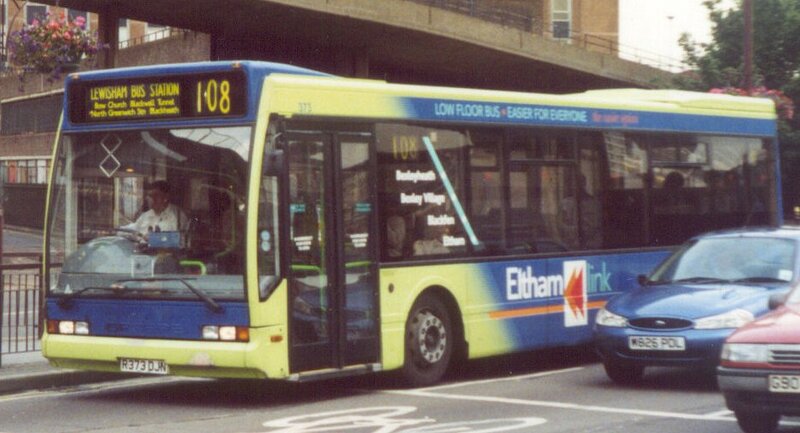 These were like the first batch, except for route 132 signwriting as the Eltham link. 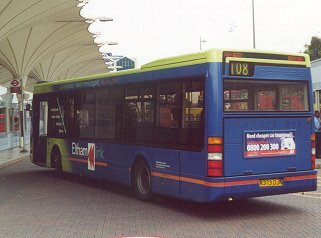 XL373, still in (incomplete) Harris Elthamlink livery in August 2000, and off its normal 132, at Stratford Bus Station. Harris Bus ran into money trouble. The tendering process just had not come up trumps for them. Whether it was a case of too-expensive bus finance, or the costs of maintaining London crew levels, or whatever (the administrators will know), they could not make the tender receipts match the outgoings. No-one wanted to take on the tender, giving a clear indication that the industry thought the numbers didn't stack up. Harris Bus went into administration, and with no commercial takeover in the offing London Buses had to take on the London end of the business themselves, in February 2000. 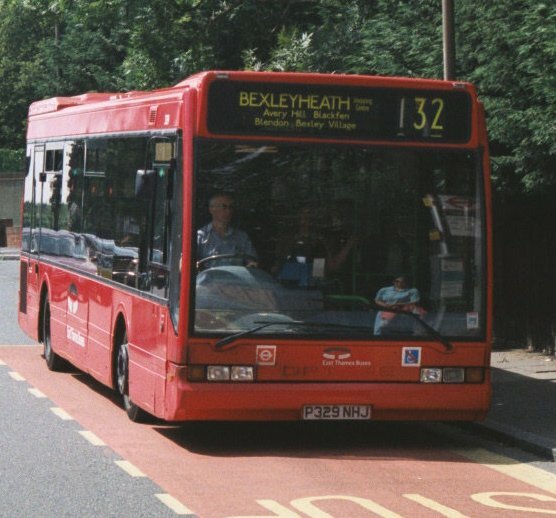 A new London Buses subsidiary was formed, known as East Thames Buses. They bought the Harris Bus Excels (all of them), as well as the DAF and Volvo double-deckers. The new company wanted to show how a London Bus Company should be run. The buses were quickly repainted into all-red livery, with an elliptical logo and East Thames Buses fleetnames. ETB used the London Buses-owned Ash Grove Garage in the Cambridge Heath area, and the ETB base at Belvedere for south London routes. 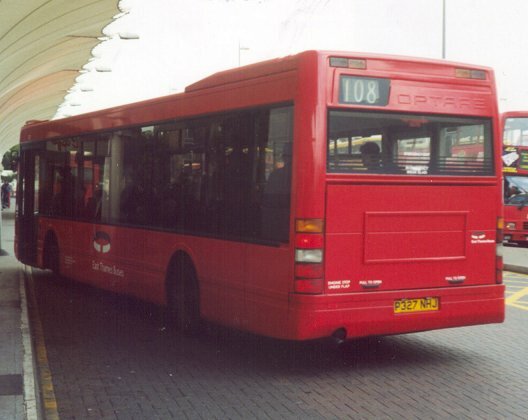 Doyenne of the class, XL321, works the 108 in October 2000, at Lewisham Bus Station. The change of operator brought a few changes in working practice. The 108 buses at Ash Grove were fitted with new blinds that allowed their use on the 150 in the evenings. Some Dart SLFs were hired from Dawson Rentals in May 2000 for use on the 132, originally while the Excels were being repainted. They were still there in July 2001. Then three were returned, and two more hired. It seems that the troubles that plagued Excels were affecting their availability. All the Excels were grouped together at Belvedere for both 108 and 132 in mid-summer 2001. Availability of Excels for the 132 faded during 2002, with substitutions made by the long-term hired Dart SLF, the two elderly step-entrance DWLs, a Metrobus, and Olympians, with occasionally just one Excel available instead of seven..
XL329 working on the 132 in June 2002, at Eltham Station, and then near Blackfen. Perhaps then it was not too surprising that in July 2002 East Thames Buses bought some of the redundant Connex Dart Caetanos, and put them to work on the 108. Three was the normal complement for a short while, then these three were claimed by Ash Grove to work alongside more of the same acquired to work route 42. The 132 was saved by an influx of step-entrance Olympians, displaced elsewhere by new double-deckers. That left the twenty-three Excels to provide the required muster of fourteen each day on the 108! Even so, DCL Darts began to reappear on the 108 very soon. It seemed odd that Excels did appear on the 42, 150 and 128 on occasions, but it seems likely that Ash Grove, where they went for maintenance, sent them out on their own routes to see how they fared. XL331 caught fire in Lewisham in November 2002, and it, along with six others, went into store at Ash Grove awaiting a decision on their future. Two more caught fire in January. The advent of the ex-DTS Scanias for route 42 allowed the Caetano DCL Darts to become the major rolling stock on the 108, and the Excels were largely side-lined. In May 2003 ETB got round to renumbering the Excels, at least on paper: ten of them became OE 1-10. The others were presumably quietly being returned off-lease. Three turned up at Manchester Airport. Four were loaned briefly to Blue Triangle in September 2003 for their route 66 take-up. Another caught fire and was written off (making three). Their final demise and departure from London service seems to have gone unnoticed: not a bang, not even a whimper, just oblivion. They just faded away, presumably quietly returned off-lease without any fuss. Unlamented, even if they were exceedingly stylish buses. Most had further careers with other operators who specialised in the foibles of Excels, some as parts donors. One operator who did hire four Excels brought four of the ex-Harris Excels back to Grays. Town & Country for several years operated in the Thurrock area, and leased 323, 375, 377 and 378, at various dates from May 2004 onwards, to operate local routes, including the 100. They did not stay long, although they did get a repaint into blue and pale blue. In July 2006 Dawson Rentals took them all back, placing them in store at Ensign Bus. The younger three then went on for further service elsewhere. Bus Stop XL Index. Harris XLs. histories. photo refs. 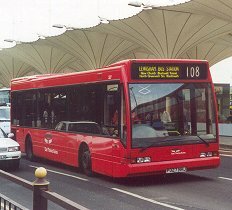 Capital Citybus XLs.